Rock weathering disintegrates, dissolves, colors, and shapes rock throughout Red Rock Canyon Open Space (RRCOS). 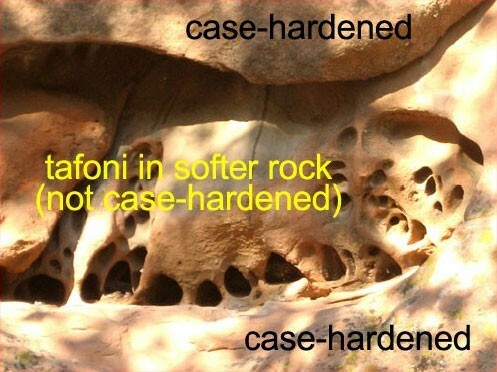 Rock weathering slowly breaks apart the more resistant rock, such as the Lyons sandstone, and more quickly breaks apart the less resistant rock, such as Smoky Hill shale. The varying strengths of the different rock types in RRCOS define the park’s unique ridge and valley landscape. In addition to rock type and rock composition, weathering processes are controlled by climate and microclimate. Generally, rocks weathers faster in wet, warm climates than in cool, dry climates. Weathering prepares rock for erosion (transport). In RRCOS, gravity, moving water, and to a lesser extent, wind, erode weathered material. The three general categories of rock weathering are mechanical (or physical), chemical, and biological. When water freezes, it expands about 9%. When ice forms in small cracks, it can fracture rock. Frost wedging is the dominant mechanical weathering process high on the flanks of Pikes Peak. There, in a much colder and wetter climate than that of RRCOS, sharp, angular, highly fractured boulders are the result of frost weathering. The sedimentary rocks in RRCOS frost wedge too, but the result is not as striking as the frost-wedged boulders seen high on Pikes Peak. When water evaporates from a rock surface, a precipitate (solid) of salt remains. These salt crystals, as they grow, exert a tremendous force on rock, and like ice, can fracture rock when they form in confined spaces such as fissures, fractures, and small cracks. If you look closely at the rock walls in RRCOS, you’ll see white salt deposits where a recently weathered (and then eroded) slab of rock once rested. When the rocks in the park were formed, they were under tremendous pressure from the weight of thousands of feet of overlying material. As this overlying material weathered and was subsequently transported away by erosion, the pressure was removed. Rocks tend to adjust to this “new” low-pressure environment by expanding or rebounding in the direction of the lower pressure. Also called exfoliation, this process forms giant flakes or spalls that resemble the skin of an onion. 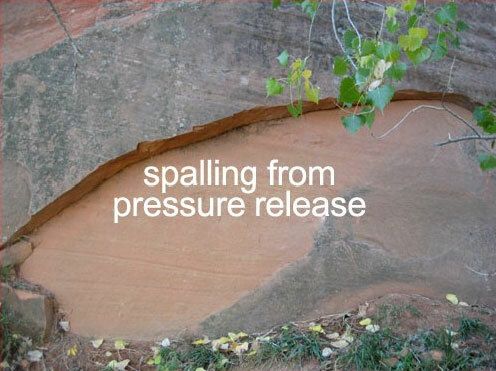 There are many spalls in RRCOS especially along the steep walls of Lyons sandstone. Insolation (solar radiation) heats, and slightly expands, the outermost surface of rock. Due to albedo, or reflectivity, when the sun is shining, darker surfaces tend to become hotter than lighter ones. At night, when the sun sets, the outer layer of rock cools and slightly contracts. In our semi-arid climate here in Colorado Springs, hundreds of cycles of expansion/contraction occur each year, slowly fatiguing the rock’s outer surface. 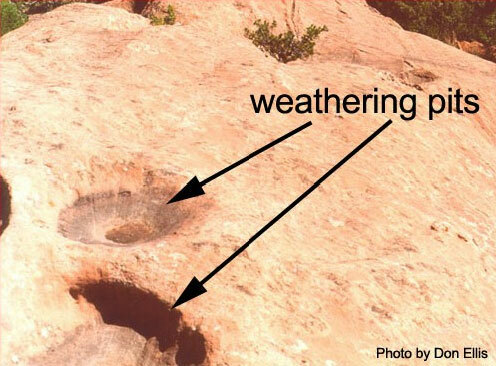 Expansion and contraction of rock surfaces occurs diurnally (day/night), seasonally (winter/summer), and ephemerally (brief shade by passing clouds). Similarly, brush fires, which can burn at 500 degrees Fahrenheit, can cause the outer, case-hardened surface of rock to fatigue, crack, spall, and ultimately erode. Look for this form of weathering on south-facing rock walls and in the roofs of alcoves where camp fires once burned. Atmospheric carbon dioxide is dissolved in rain and snow, and forms a weak carbonic acid on the earth’s surface. Carbonic acid dissolves certain minerals in rock, such as those that bind the sand grains together in sandstone. By dissolving the matrix cementing quartz grains (sand) together in sandstone, solution leads to grain-by-grain disintegration. When carbonic acid contacts the calcium carbonate in limestone, the calcium forms a solution (calcium bicarbonate) and is removed, leaving the voids we know as caverns. Carbonation is a solution weathering process that has formed large caverns in limestone, such as Cave of the Winds. In RRCOS, carbonation has formed small cavernous voids in limestone. Hydration stems from cycles of wetting and drying. The process involves the attachment of hydrogen ions and hydroxide ions to molecules in minerals. The addition of these ions ultimately leads to the expansion of minerals, which causes flaking and disintegration of rock in RRCOS. An important weathering process in nearby Pikes Peak granite, hydrolysis leads to the formation of clays from the silicate mineral feldspar. Feldspar minerals are the “pink” in our local granite and can be found in the Fountain formation. Commonly known as rust, oxidation stains rock red. When minerals such as iron and magnetite are exposed to oxygen and water, they oxidize (rust). Oxygen and water are both readily abundant at the atmosphere/rock surface interface and actively work to weaken iron-bearing rock. Many sedimentary rock types in RRCOS are somewhat oxidized. Tree roots, in their quest for water, grow into cracks, fissures, and faults in rock. As they grow and expand, they easily break rock apart. 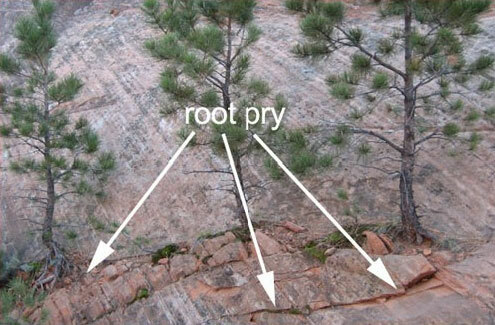 Root pry is a principal weathering process in RRCOS – especially along the margins of steep rock slopes. When trees fall or blow over, they sometimes pull up chunks of rock. The next time you see a downed tree or other plant, search the root mass that rests above the ground for rock. Rock coatings range from extremely thin coatings of silica, manganese, or clay minerals, to mats of lichen or moss (Dorn 1998). Rock coatings, which are ubiquitous throughout RRCOS, characterize a rock’s surface color, which is almost always different from the color of the rock’s interior (Dorn 1994). These coatings on rock weather rock by trapping moisture just below the surface. 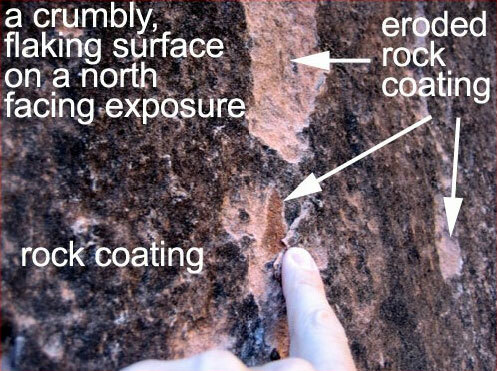 Conversely, rock coatings protect rock surfaces from weathering by providing a temporary armor. Lichen, in addition to serving as a moisture trap, weather rock mechanically as their rhizines (root-like strands) burrow into and tug on clasts and minerals, and chemically through dissolution (Paradise 1997). Interestingly, lichen are thought to play a role in forming other rock coatings, such as coatings of silica (Lee and Pearsons 1999).